John Howe is a Canadian book illustrator, living in Neuchâtel, Switzerland. One year after graduating from high school, he studied in a college in Strasbourg, France, then at the École des arts décoratifs in the same town. He is best known for his work based on J. R. R. Tolkien's worlds. 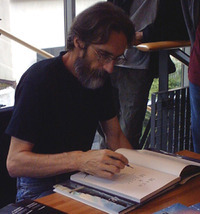 Howe and Tolkien artist Alan Lee served as chief conceptual designers for Peter Jackson's The Lord of the Rings movie trilogy, and Howe also did the illustration for the Lord of the Rings board game created by Reiner Knizia. Howe also re-illustrated the maps of The Lord of the Rings, The Hobbit, and The Silmarillion in 1996–2003. His work is not limited to this, and includes images of myths such as the Anglo Saxon legend of Beowulf (he also illustrated Knizia's board game Beowulf: The Legend). Howe illustrated many other books, amongst which many belong to the fantasy genre (Robin Hobb's books for instance.) He also contributed to the film adaptation of The Lion, the Witch, and the Wardrobe by C. S. Lewis. In 2005 a limited edition of George R. R. Martin's novel A Clash of Kings was released by Meisha Merlin, complete with numerous illustrations by Howe. Howe has illustrated cards for the Magic: The Gathering collectible card game. For The Hobbit films, original director Guillermo del Toro and replacement director Peter Jackson both consulted with Howe and fellow conceptual artist Alan Lee to ensure continuity of design. Howe is a member of the living history group the Company of Saynt George, and has considerable expertise in ancient and medieval armour and armaments.